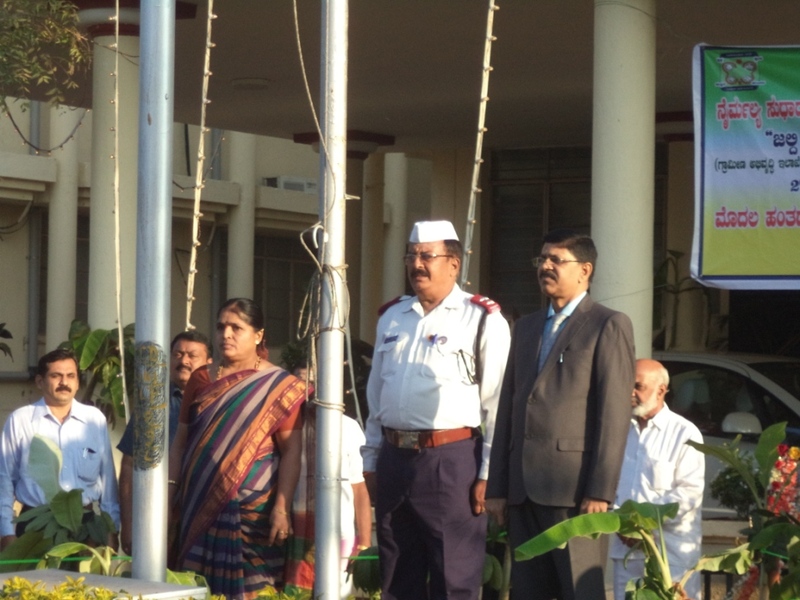 The drill involves inviting every household, early in the morning, for an evening event followed by a reminder rally by school children at around 4PM for the same. The event includes a skit, 3 short films and a couple of speeches by local government authorities ending with a pledge by the citizens to build toilets for their homes to eliminate open defecation. All this would have been simple had it not been for the difficult infrastructure challenges in our villages. Road conditions, literacy levels, power availability etc. cannot be taken for granted and hence a mobile unit has to prepare for pitching its tent wherever the crowds feel comfortable about gathering. So I was thrilled when on day one of our rollout everything went to a plan till such time when our show was to begin. The morning invites were done as planned and the kids did their bit to generate enthusiasm through their procession and the events team found a clean village square right in front of a temple and strung together the projection screen on the temple entrance. We tested the equipment – the film on DVD to be projected through the laptop and LCD projector, the sound system, the cordless mikes and the power back up for the equipment. To our surprise, it all worked fine and we were waiting for the sun to set so that the crowds gather and the show could begin. However, while it kept getting darker, the crowds never came. There were dozens of children waiting for the films and a bunch of hangers on watching us all from a distance while pretending to be busy with other work, but only a handful of them can be called our audience. And most importantly, no women at all had joined us for the program. Our little investigation revealed an entirely new set of barriers that will now have to be factored into our SOP. First up, out of their eagerness, we were taken by the local contacts to the most developed part of the village to host the event. This part not only has very high toilet ownership but is also a cluster of upper caste, well off houses for whom toilet ownership and usage was no longer an issue. But more importantly, this area, through an unspoken rule, is out-of-bounds for the less well-off caste/class of people from the village who live in an entirely different cluster on the other side of the highway (which runs through the village). Those people, for whom building toilets is a much bigger need and an even bigger challenge, did not dare to walk across to be a part of our event. 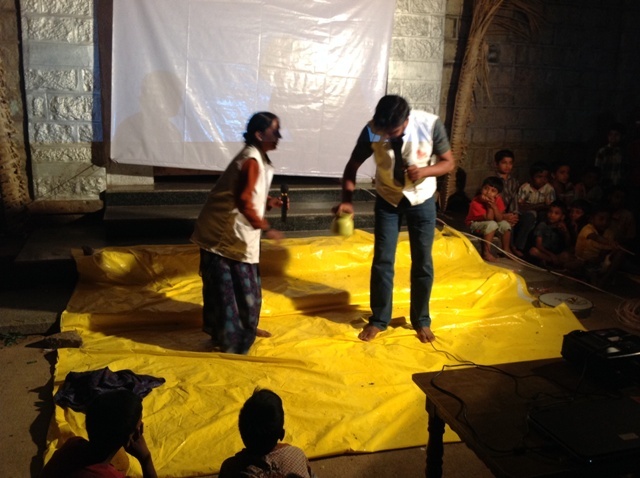 And when we decided to move our show to the other part of the village and as we were setting the stage, a decent crowd gathered which included adults and children, men and women. However, just a few minutes into the show a group of men from the village stepped onto the stage hurling abuses at the government officials for not paying up for the toilets already built. It resulted in a major altercation with allegations flying thick and fast about jobs half done and promises not kept. And as the situation started escalating, the women and children slowly started moving back to the safe confines of their homes. Fortunately, things never reached a point of physical violence but our team decided to call it a day since it was already well past ten in the night. While we got out of the village with our bones and our equipment intact, it opened our eyes to a set of preconditions that we had not factored into our preparation. While we were aware of the anger against backlogged payments, the extent of restrictions caste clusters impose on movement within the village was severely underestimated. As we head out today to mount another expedition against open defecation, it will be interesting to see what else rural India has in store for us. 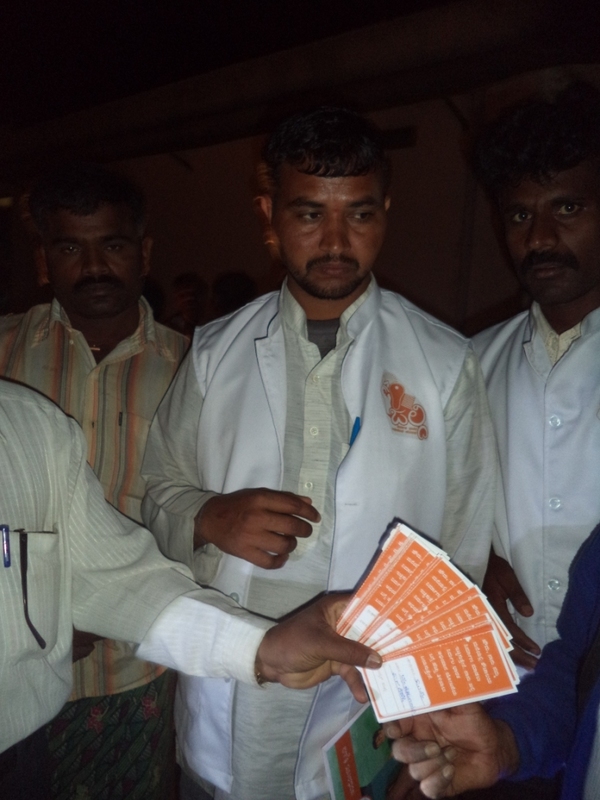 The communication in campaign is currently being piloted in Davangere. 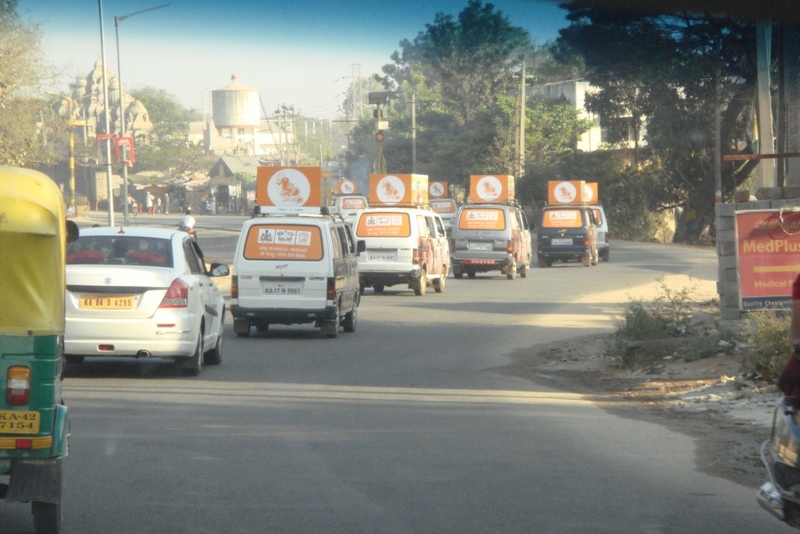 9 vans are travelling to different villages every day, where an event is being conducted in the evenings when most people are back from work or school. 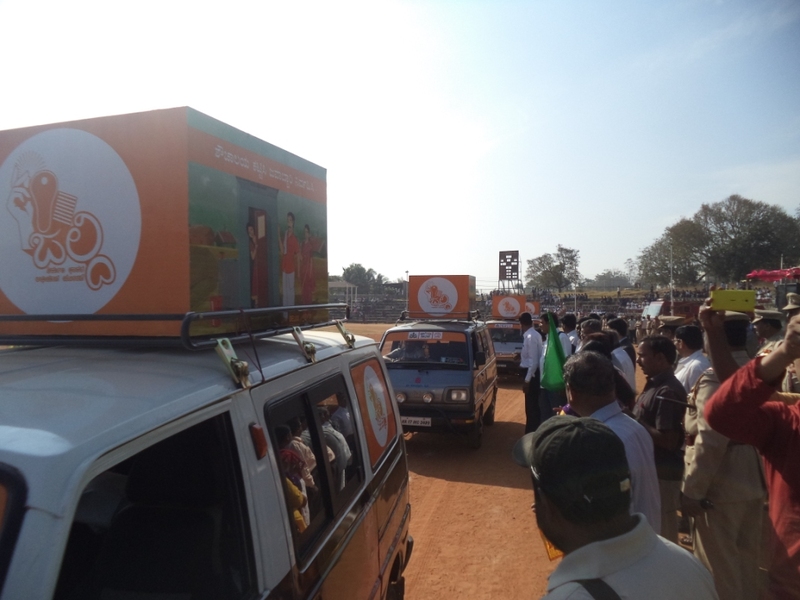 Below are some pictures from the first few days of the campaign being launched. 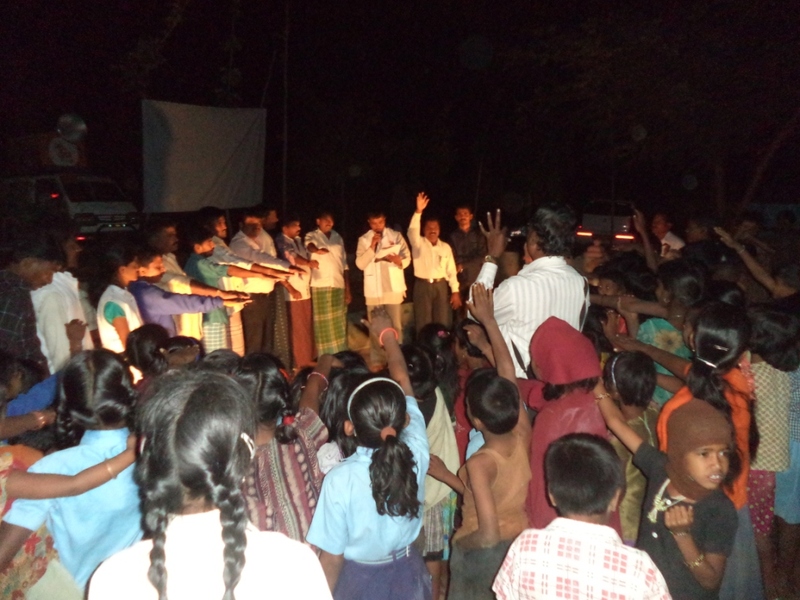 The audience joins the campaign and takes a pledge to build toilets in their village. 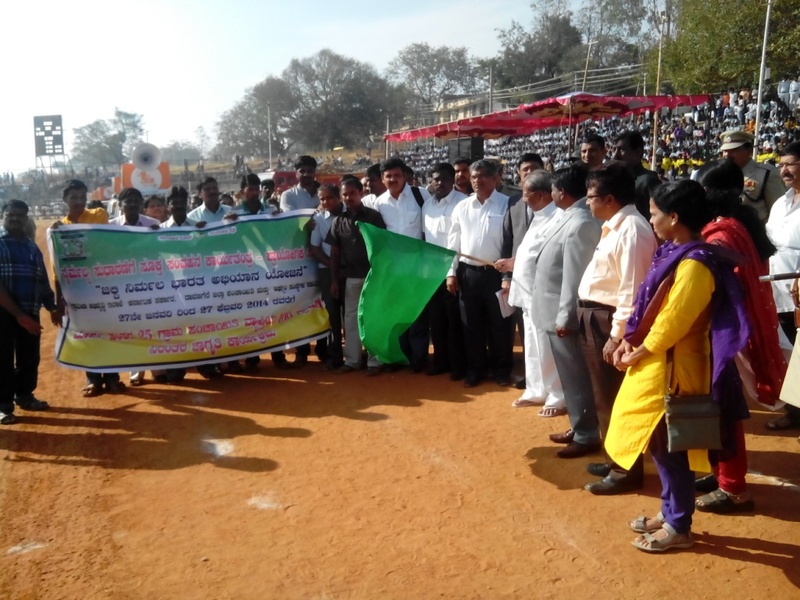 The communication campaign developed by Centre of Gravity, in collaboration with the Davangere NBA team, was launched yesterday at the Republic Day function of the district administration. 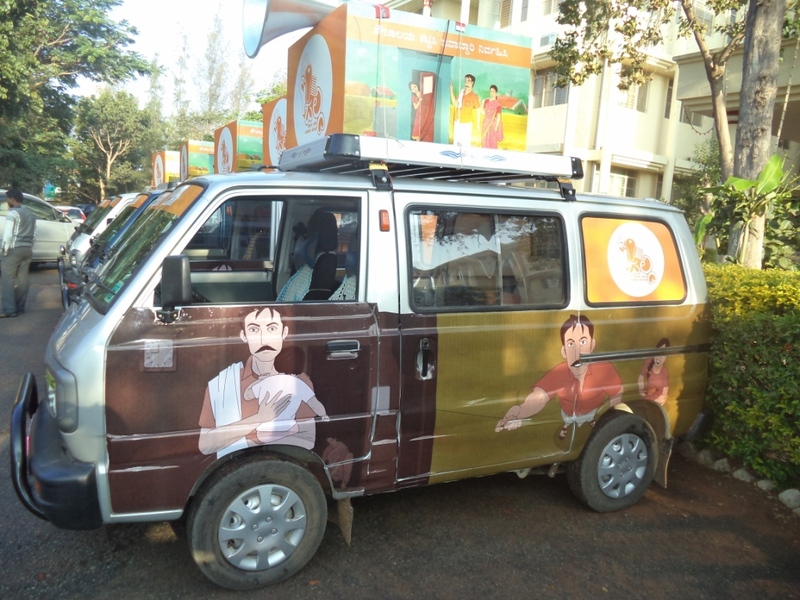 9 vans circled the stadium in Davangere where the function was held, and were flagged off by the District-in-charge Minister Shree Shamanur Shivashankarappa. An important dimension in our study has been the barriers to adoption of toilets. And given that our mandate was to develop a communication-based solution, the effort has been to identify those factors that can be impacted by using communication. However, as we discovered, there are barriers at multiple levels that make open defecation (OD) a multifaceted phenomenon. Let’s look at some of them. At the most fundamental level there are aspects of the environment that make it difficult to build and use a toilet. Small houses, lack of water and financial constraints are significant barriers. In the catchment we studied, the average income was around Rs. 30,000 per annum and average land-holding was around 2 acres. An expenditure of Rs. 10,000 on a toilet therefore becomes a significant stretch unless someone in the house desperately needs one, like an old mother who can barely walk or a pregnant daughter. Enhanced water and space efficiency require major innovations, which are beyond the scope of this project at this point. However, the financial incentive provided by the Nirmal Bharat Abhiyan (NBA) scheme does address a very significant barrier. However, a mammoth government scheme like the NBA, which is extremely difficult to navigate and that is prone to corruption further contributes to the barriers people face while owning a toilet. Another significant barrier to adoption is the issue of existing behaviors. A habit formed over decades as a daily ritual is extremely hard to break even if the desired behavior is a more convenient alternative on the face of it. For instance, I did not grow up with the habit of night-brushing and therefore find the practice difficult to inculcate. Using a toilet is a similar behavioural change, particularly for men. 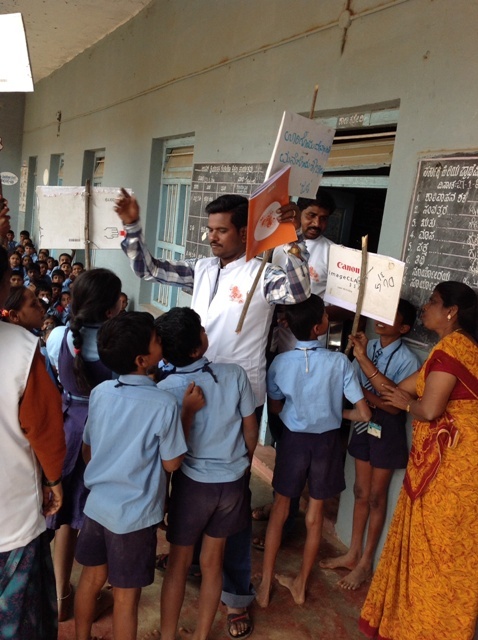 To that extent, inculcating the habit of using a toilet among children represents a critical opportunity in making this transition towards reducing OD. At the next level are barriers of capability. These are also more in the mind as defecation is not something that needs to be learnt. Yet there are many who will tell you that they are not able to defecate inside an enclosed space. However, as we found, this is not a significant barrier. The biggest barrier to using toilets is the belief that OD is not particularly harmful, and that there is no significant benefit from using a toilet. Most government communication tries to target rural audiences at this level, using the arguments of health and well-being. Yet they do not find much traction as people do not experience the ill effects of OD or the positive effects of using toilets in the short run. Using toilets is just not important from a health perspective. The most significant opportunity that we found a communication strategy could address, was in the area of identity. There is a general positive association between toilets and people who are well-off and modern – that people who have (and use) toilets care for the women of the house. The majority of men will associate these identity values with those who own toilets and yet they do not think of themselves like that. For them, those who use toilets are different. It is this gap which our communication strategy aims to bridge, by upping the volume on the idea of ‘what kind of man’ you are, or what kind of man you want to be. 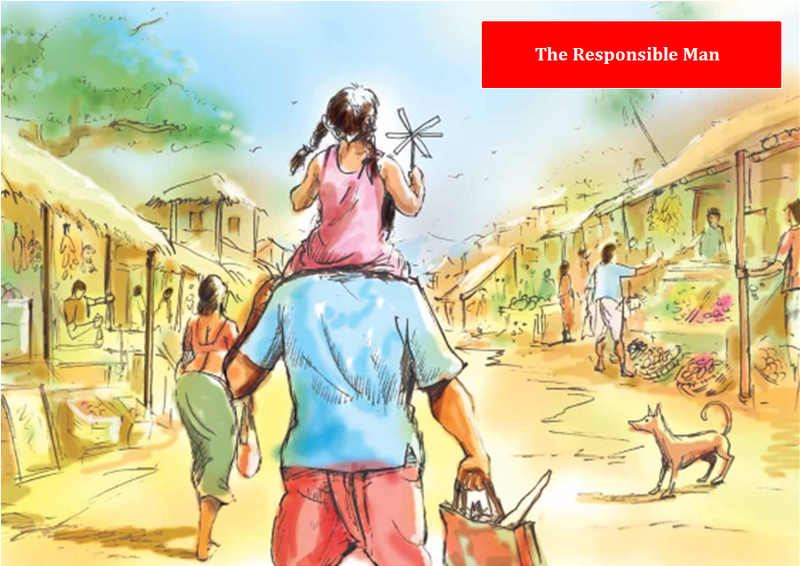 Our strategy poses the question – are you a responsible man? Do you want the women in your family to see you as a responsible man? At the heart of the identity of a responsible man is the notion of modernity. A man who cares for women is seen as a more modern man and while most men in villages will not acknowledge it, their personal modernity evolves over years with the acquisition of small symbols of modernity like stitched clothes, a watch, a two-wheeler and of course, the mobile phone. By provoking this thought we hope to reduce the need for complex justifications for toilet ownership and efforts will certainly be required to make the environment more toilet-friendly. Only when these two work in tandem can we hope for an OD-free India. As we approach the execution stage of the project, I wanted to recollect the preceding stages and draw out some conclusions from it. Over the next few blogs I intend to share the transition we have made, from complete vagueness to a semblance of clarity on the subject of open defecation. When we were briefed by Arghyam on the nature of the task, we were confronted with mixed emotions. On the one hand, we love that rare combination of a ‘making-a-difference’ assignment with a good client at the helm; on the other hand, I don’t recall an assignment where I was confronted with as many operational barriers (as it turned out they were mostly in our minds). To start with, this was a rural project and we had a very limited exposure to how things work in rural India. 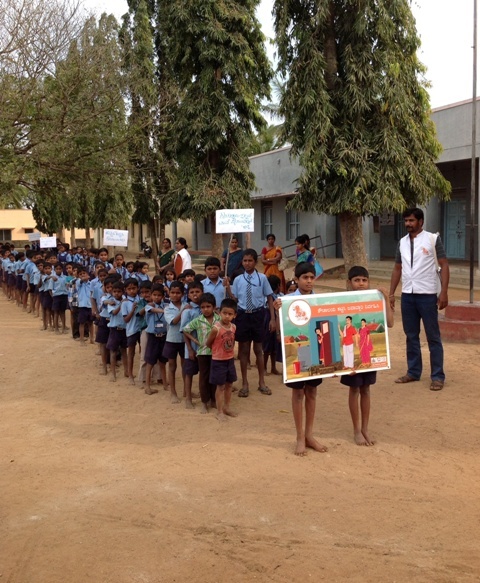 My collegue Balaji was fresh out of a project promoting handwashing, but personally I had not done anything remotely rural. In our work in microfinance and affordable education, I had worked with economically weaker consumers but they were urban and to that extent, in many ways, their design of life was familiar. When I stepped into an urban slum I understood how they were impacted by their geographical co-ordinates, the symbols of status, day-to-day challenges etc. However, in a rural setting, a whole lot of data that we process almost subconsciously is just not available. For example, we had very little understanding of the cycle of livelihood in the village as it is seasonal rather than daily. There are weeks of complete inactivity followed by a few weeks of intense labor, creating a very different rhythm of how money is earned and spent. The houses are organized by caste/community clusters, and status has a lot to do with the reputation of a family over generations. We certainly had no way of knowing that. 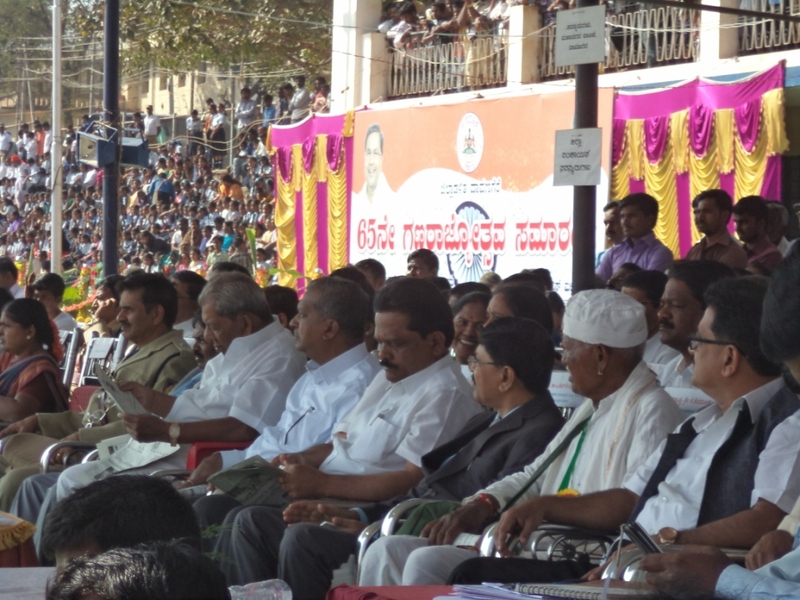 Further, this was not only rural, it was Karnataka – a language and a geography all of us in the team were unfamiliar with. We were completely at the mercy of interpreters and clearly a lot of flavor would have been lost in the process. To top this, we were researching defecation – a very private, uninteresting topic for anyone to discuss. While observational research was more or less ruled out, we wondered if people would even be willing to discuss it openly. And if this wasn’t enough, we realized that open defecation (OD) was a challenge mostly faced by women, and we were an all-male team. There was also a high degree of concern in our team regarding the extent of research that was possible and if we could trust the quality of the data. As I said earlier, most of these doubts proved to be unfounded. While the differences do exist, human beings are similar in many more ways and it took some time, but we were able to get into the life context of our audience as deeply as we did with audiences who were more similar to ourselves. We found the topic of defecation remarkably accessible in our conversations and I would stick my neck out to say that it is far more devoid of any taboo or embarrassment when compared to urban settings. Women spoke frankly and freely on the topic even while talking to men. 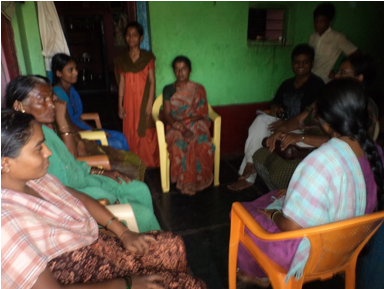 Centre of Gravity talking to people in Davangere during their research phase. Looking back, my only regret (if I can use that word) would be that I did not speak Kannada. I am sure that, like in every language, there are words that capture a phenomenon, an emotion, an encounter in the life of our audience so precisely that no amount of sophistication, exposure or translation can compensate for. And I am sure our work is poorer to that extent. Toilets, and the lack of enough of them, are a recurrent topic on prime time news these days. It would have been difficult to imagine such a situation just a couple of years back. We need to remember that our real goal is not toilets, but sanitation. The former is easier to understand. The latter is much more than just toilets. Sanitation, by the textbook, means the process of keeping people and places free from dirt and germs and thereby, infection and disease. This is achieved by the safe handling and disposing of human excreta, garbage and other waste. Other requirements include personal hygiene (including hand-washing and menstrual hygiene), clean food and water, storm water management, and more. 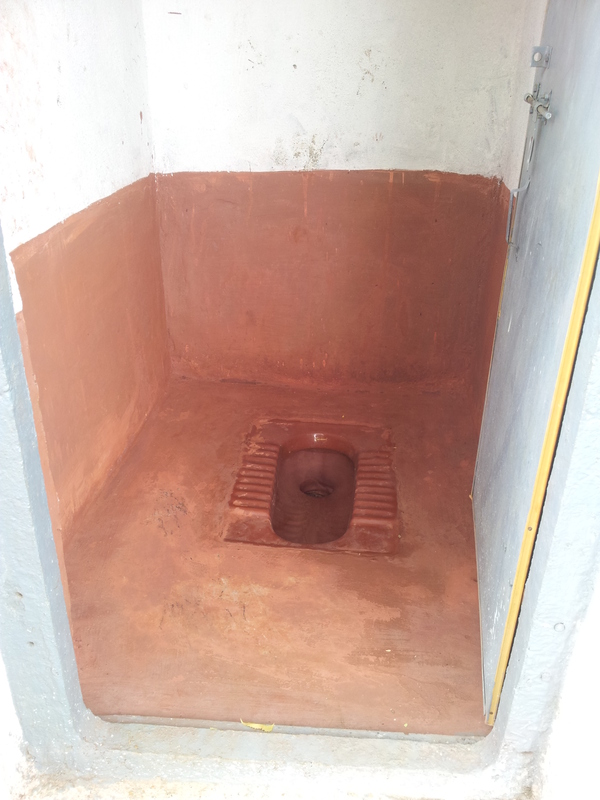 So toilets are only one step in the long road to complete sanitation. However, evidence suggests that it is one of the most important steps. Theoretically, one can safely handle human excreta without building toilets – in some cases, all it takes is a hole in the ground, properly covered, to safely dispose of human waste. Conversely, building toilets does not guarantee sanitation; in fact perverse results can happen with inappropriate technology and construction. Case in point being Kerala, where the high groundwater table has resulted in toilet pits contaminating the groundwater. As a nation, we have survived for centuries without toilets. While at work in the fields, agricultural workers do not have access to toilets and this is unlikely to change. They will, therefore, continue to spend their workday in no-toilet zones. The goal of the Nirmal Bharat Abhiyan, the flagship programme in rural sanitation, on which Rs.6,140.2 crore had been spent through 2011, is an “open defecation-free society”. Getting there quickly will be very difficult from where we stand today. Read the entire article (originally published on Livemint) here.